I am restoring all these features. On the first-floor is a niche in the expansive entry/stairhall. To the left, is a door. The door opens to a small, oddly-shaped closet. But this is no ordinary closet. 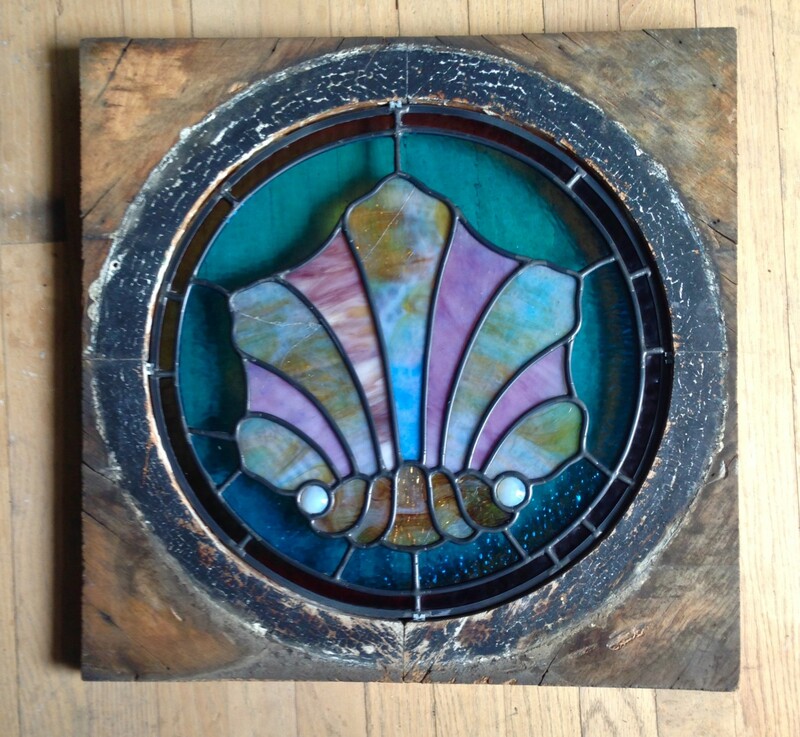 One curious aspect is that it contains a round stained-glass window. 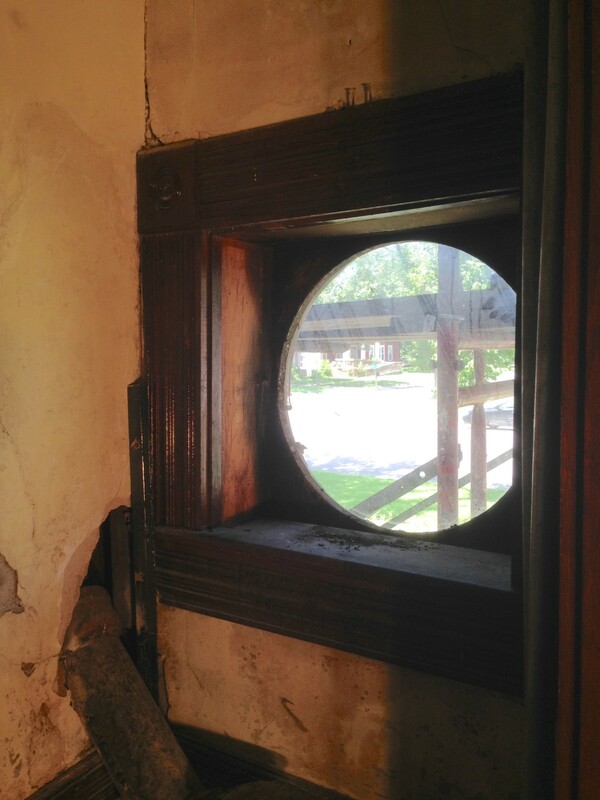 There is also an operable transom window above the door, the only such feature in the whole huge house. For, the closet was not intended for clothes, but for making telephone calls. The niche. Looking poorly but still fabulous. 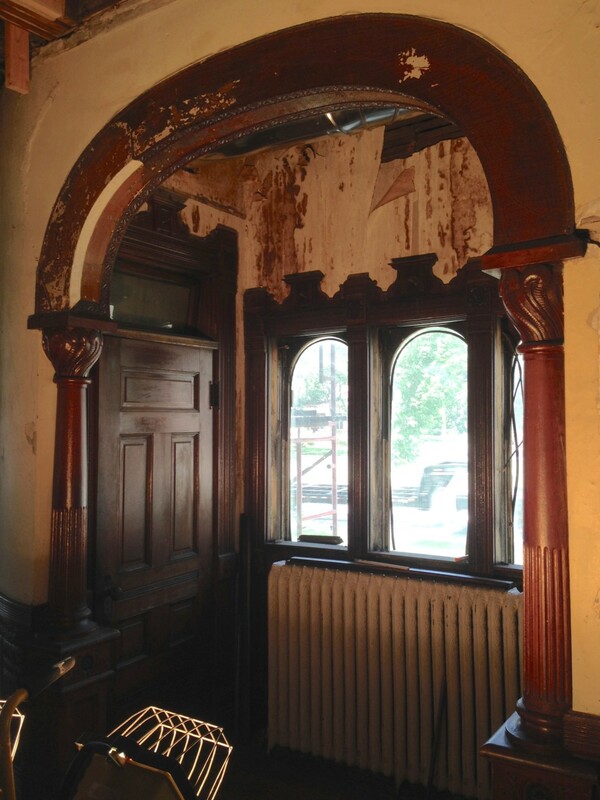 The windows are stained-glass, but these have been removed for restoration. See the door? 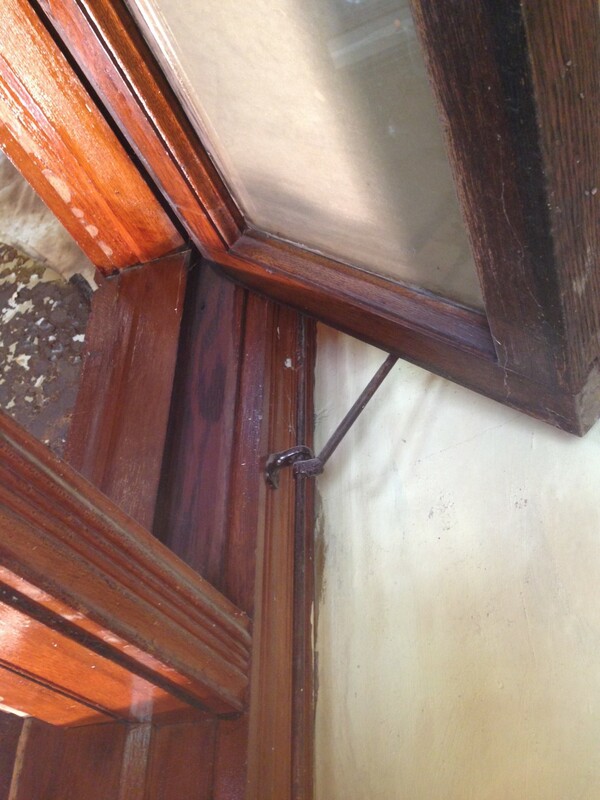 The door has a transom window, the only one in the house. 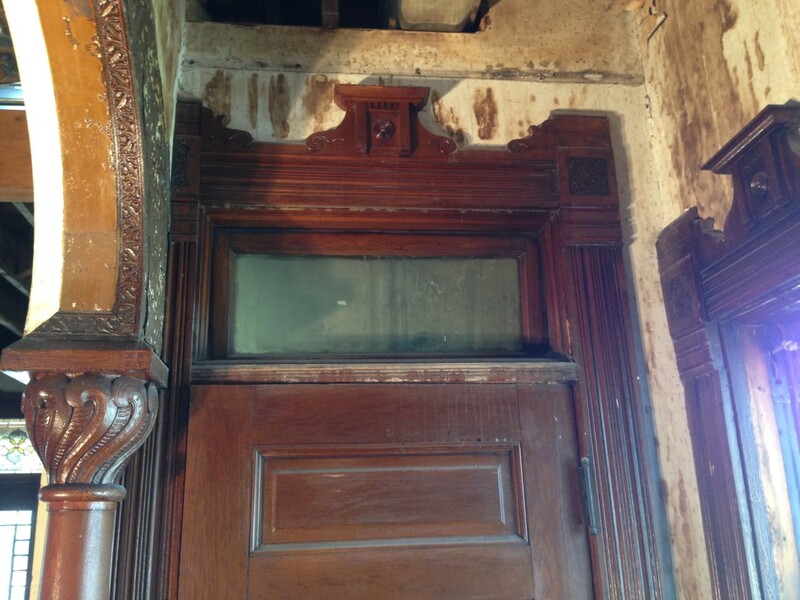 The transom retains its original WAY COOL hardware, and it still opens/closes. The closet is oddly shaped. Deliciously so. The waste pipe is not original and will be removed. Gleefully. The lower walls feature the same Lincrusta which abounds on the first-floor, but is mostly missing in the telephone closet. No matter, I will have it recreated. …like this. It is currently being restored. 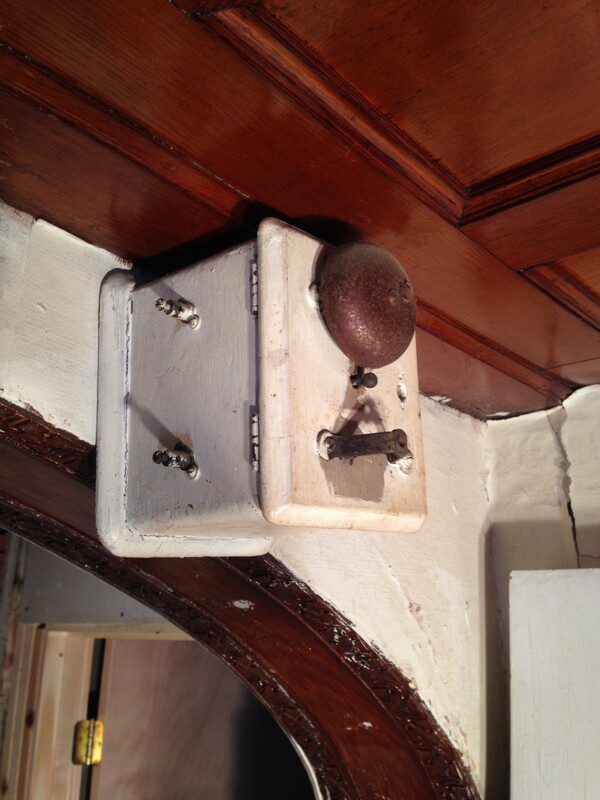 There is a very very very vintage light switch. I absolutely plan to retain this. In working condition. Across the hall is this telephone ringer. I have no idea of how old it is, except that it is very very very old. Could it be original? The telephone closet would have certainly had a REMOTE ringer, as with the door to the closet closed nobody would have heard the phone ringing. 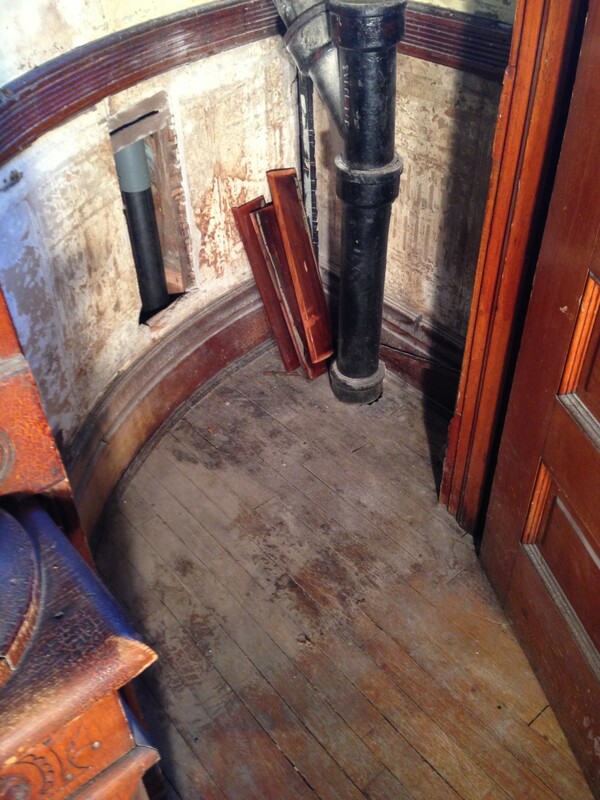 I greatly look forward to restoring the telephone closet. I will also have restored the ancient ringer. Surely there exists somebody who restore such things? I will install a landline wall-hung telephone in the closet. I will not install a phone from 1894 but rather a modern phone. A vintage phone would be cool, but not easy/comfortable to use, resulting in my not wanting to use the telephone closet much. I will place a small, comfortable chair in the closet. I will have installed a tiny shelf to hold a glass of wine. And when all this is done, my first call will be to Tamara. 11 Responses to Tamara, will you please join me in the 1894 telephone closet? The box is a remote ringer. I plan to do a post on it! Oh Ross thank you, thank you, thank you! I am in love with your closet. 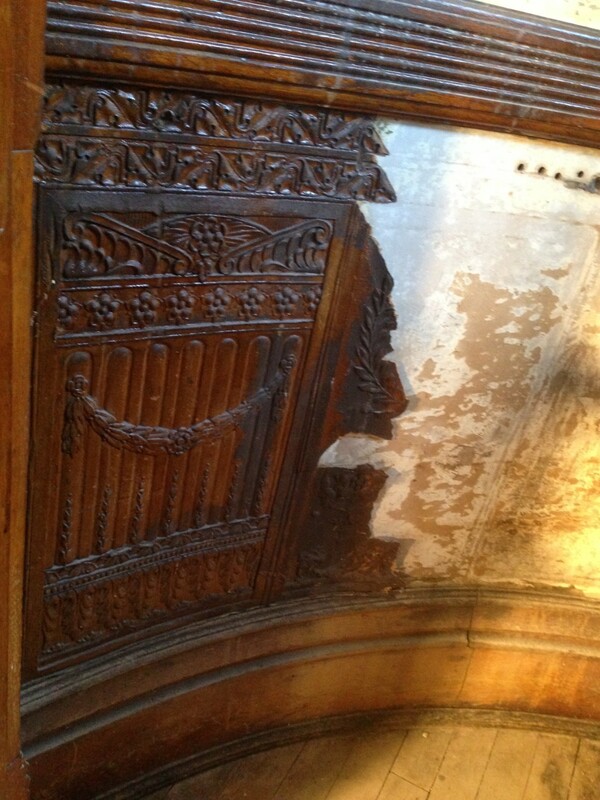 Such a quirky little feature which absolutely abounds with character! And now with my curiosity sated I can drift into dreams of quiet footsteps and late night trysts, of whispered conversation behind a closet door with soft light sparkling through a stained glass as round as the moon which it frames. I raise my glass to you in a toast of admiration. You’re so lucky to have found a house that still has a trace of things like the telephone closet, the dumb-waiter, the laundry chute, etc. 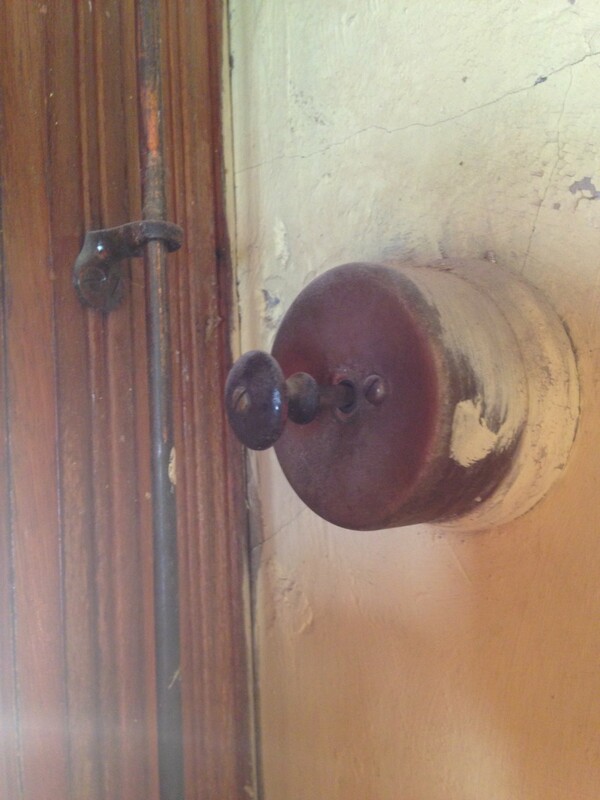 These are things many houses had at one time, but have been removed from the majority of houses in an effort to modernize. I hate seeing big, old Victorians homes with nothing remotely Victorian about them! Ross, I read every single post that you create, and also enjoy every single one! I don’t always comment, well, because my dialogue is mostly an inner one. I LOVE Tamara’s request to you, and this post in response! I too have been very curious to learn more about your awesome telephone closet. Wonderful! Jealous. Just jealous. I want your life. Well, at least your house if I can’t have your life. Gasp! I guess we all collectivley came out of the closet together on this one… Egads! Jason, thank you for the idea to Google “1890 telephones”. I shall do that to see all of the choices Ross has. Ross, I can’t wait to check out your options! Your blog provides such joy to all of us followers. Thank you for sharing your Victorian Journey with all of us. I shall toast you tonight!! No problem! Telephones back then, were works of art! Like a lot of things, that we take for granted these days, back then they were luxury!